You woke up late in the morning, realising you are getting late for your work and incidentally you are running short of shampoo or a soap or anything that you can’t do without. What would you do? Most probably, you’re going to rush to your local Kirana shop and get the issue fixed up. This ‘quick-fix’ is probably what aids kirana stores in winning over their organised counterparts, as has been revealed by an Assocham study. According to a recent survey done under the aegis of Assocham Social Development Foundation, it was found that shoppers in India prefer their local Kirana shops over malls. A country-wide survey that was conducted in 15 major cities along with the metros and was completed in a span of two-months ( March-April 2010) revealed that it is a myth that retail outlets at malls and shopping complexes store quality products as, Kirana shops too offer quality products that too for a negotiable price. The survey of the apex chambers suggests that the shoppers love to hangout and shop from their local traditional stores, more so because of the familiarity with ambiance, ease of access, variety of goods, early opening and late closing times etc., which suit to the local residents. More often than not, these Kirana stores are present in the vicinity. You can just stroll over and get whatever you require, even something as petty as a matchbox. Malls require a bigger space they are mostly located at a secluded place, away from the residential area. Therefore, transportation becomes an issue to consider hypermarkets located at a mall for regular shopping. Buying in bulk is also not feasible due to paucity of storage area in a house. Weather conditions and the tendency to eat and buy fresh also refrain people from making malls as their regular shopping destinations. The other major factor which makes the kirana stores a favourite is the price factor. “I haven’t come across any mall that is cheaper than my local kirana store. I like going to malls but altogether for a different reason and not for shopping” says Deeksha, who studies at Delhi University. Anjali Dey, who is a homemaker quips “Malls may give some discounts at a particular time but not always. Kirana stores are definitely a lot cheaper.” Earlier the MRP wasn’t negotiable, now the norm has changed. The kirana stores also support the ‘credit system’. A system that shoppers in India have been following from generations, which has now became an integral part of their shopping habit. A kirana store, offers goods on credit, or has monthly payment schemes etc, which facilitates running a home within a limited budget. “We had a slump in sales earlier, but then we started regaining our clients. As we believe in providing convenience to our customers, we provide them with facilities like free home delivery, credit on monthly basis, on the call service in the neighbourhood etc. 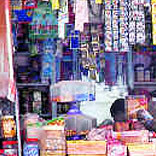 And we sell the products at the best available price.” says Jaiveer Malhotra, who runs a kirana store in Malviya Nagar. Shopping in India always had an emotional tag attached to it, although this tag has been shedding gradually with growing disposable incomes and people getting out of there shell and exploring new brands and products, but still it has a long way to go. Indians have been following the tradition of relying on traditional retail for grocery and the mindset doesn’t seem to elude them for long. “The modern stores have just appeared in the scenario while the traditional kirana stores have been there from generations,” opines Byas Anand, Head-corporate communications, Dabur. “Lala ji (the grocery store owner) has always been considerate and close to all of us. We can't break that relationship. I did go to mall once, but felt lost and like an alien there” says Rashmi Bhagwat, who teaches at an MCD primary school. India is the fifth most attractive emerging retail market in the world. The Indian retail sector is estimated to be worth USD 200 billion. Out of which only 3 per cent is organised. The organised retail market is worth USD 6.4 billion. Of late, FMCG companies have realised that a major chunk (almost 80 per cent in some cases) of their business comes from the traditional retail. Considering this, they are lending their support to the kirana store-owners by coaching them and helping them modernise. “The malls (hypermarkets) hardly account for 7 per cent of sale for FMCG products. The rest of the market has been captured by the traditional stores,” opines Anand. It is basically the ambience that attracts customers to malls. However, when you have to catch your weekly supplies on a busy weekend, air conditioning and ambience are the last thing that you would care for. In a nut-shell, local kirana shops form the backbone of shopping in India, and are here to stay!